As every year for more than a decade now, the usual Anteprima Amarone event was held last January. In the prestigious Palazzo della Gran Guardia in the center of Verona, a number of Valpolicella wineries present samples of a vintage not yet bottled to the public and the specialised press. The year of the last edition was 2014. A particularly important year because it marks the 50th anniversary of the establishment of the Controlled Denomination of Origin (DOC) for Amarone. However, this event is beginning to show signs of fatigue and many are beginning to question the real usefulness of this event. If the aim is to draw some attention to the Amarone product, then perhaps it is understandable. It actually brings a bunch of international wine journalists and critics to Verona, some influencers, newspapers have something to write, social networks are filled with shots of full glasses and beautiful girls with a serious and rapt face while smelling wine. The halls of Palazzo della Gran Guardia are crowded with wannabe-successful-sommeliers engaged in intelligent conversations and elaborate descriptions of aromas and scents. If, on the other hand, the aim is to evaluate the actual potential of a vintage yet to be bottled, then its usefulness is certainly questionable and the fact that “preview” events are multiplying even for wines with short production period, to be consumed young, confirms that these are events mostly made to attract a little attention, creating an allure of exclusivity for people that are made to believe that they are great wine connoissour. If you are not a fully trained oenologist or a highly experienced sommelier, it is almost impossible to assess the potential of a wine with a such a long aging and evolution like Amarone simply by tasting samples from the barrel. To overcome the disappointment of the majority of visitors, who pay a ticket every year more expensive, when they taste such sour and astringent wines, the organizers allow exhibitors to bring even bottles of previous vintages (and include in the admission a quite lavish catering). Moreover, in a scenario in which production egulations establish only the minimum aging of two years, and each producer canthen decide to leave the wine longer in the barrels, you end up having in the same event wines from the same vintage that have just been bottled and barrel samples that might be marketed in 1, 2, 3 years, with a lack of homogeneity that can give rise to great confusion and even damage the image of participating wineries. 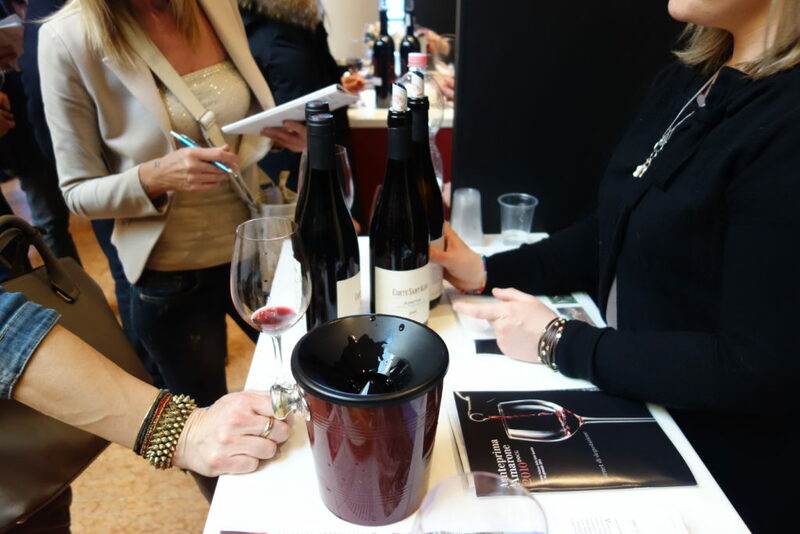 Perhaps these contradictions, together with the constant producers feuds, are the reasons why many wineries, especially the most important and famous ones such as Masi, Tommasi, Allegrini, do not participate the event or, if they are present, they do so by bringing their second lines, such as Bertani, which participate with Amarone Valpantena with an aging of only 2 years, and not with Amarone Classico which remains in cask for 5-6 years. This year there was one more reason for perplexity. In fact, 2014 was a very controversial and difficult vintage, ravaged by rain, low Summer temperatures and hailstorms. Many wineries decided not to produce Amarone at all, as the grapes would not have been able to withstand a drying period of three months. In the 2014 Amarone Preview, wineries were therefore allowed to bring in the next vintage: 2015. This has given rise to further controversy. In fact, the bad weather conditions were not the same throughout the territory and for all producers. Some were able to obtain satisfactory results and were able to put a certain amount of grapes in their fruttaio (grapes drying lofts). The rumor that 2014 will not be a good vintage by now, however, has spread among professionals and wine enthusiasts, and could create problems for those who still managed to make Amarone that year. The choice made by Anteprima Amarone, to allow those wineries that have not produced this vintage to present new ones instead, will only worsen the bad reputation of 2014, damaging those who, thanks to the position of their vineyard and the ability in the cellar, did a good job. In short, there are many reasons to reflect on this type of event. Perhaps, for a wine with the long aging and evolution potential like Amarone, it would make much more sense to hold an event where the public is presented with a vintage 5, 10 or more years after bottling, understanding how the wine in this time improves, refines, develops new aromas and flavor, comparing various producers on this. But this is unlikely to happen because it would put a lot of pressure on cellars, with comparisons that for some could be really merciless. It would be easy to reveal those work whos thinking about the future and those that instead looks for immediate results.